So last week’s dinner menu went well but boy did I veer off track a few times. We never did end up having the soup I’d planned so that will definitely go back on the menu this week. Potato soup is my daughter’s favorite and I’ve promised her this week for sure. I did however make the Black Bean, Corn & Chicken Chili (on Thursday, rather than Tuesday!) and it was really good. The big hunks of tomato from the canned tomatoes didn’t go over too well with the kids so next time I would use the petite cut tomatoes to see if that makes a difference with them. The best part was watching my “slaves” work hard preparing dinner that day. Chili and Buttermilk Wheat Bread in the bread machine. Yum! Have you got a bread machine hiding away in a cupboard? Why not pull it out and make the bread machine recipe linked above (or the one below), it is so good and your family will definitely think you are a ROCK STAR!! I also wanted to tell you about a fantastic Special Fall Bundle that Menu Planning Central is offering this week only ~ this special bundle for fall includes TWELVE ebooks as listed below for only $10.00!! Who doesn’t love a fresh crisp apple this time of year! This e-book walks you through the various apples and their uses, the best way to buy apples, what to do if you end up with a ton of apples, delicious yummy apple recipes and much more. Pumpkins are great for both decorating and eating! Learn how to choose and store pumpkins, fun uses for pumpkins and of course delicious pumpkin recipes! This resource includes 29 super fun and creative fall & Halloween recipes the whole family is sure to love – everything from Halloween Party Fondue, to Vampire Bat Stew, to Ghosts on a stick. Our family is working on cutting out a lot of processed foods. In this ebook I share what whole foods are, why they are important, info. on organics, how to eat whole foods on a budget and much more. If you are interested in learning more about whole foods – this is a great guide! Even more Halloween recipes and some great games to play at your Halloween Party. With this bundle you certainly won’t be at a loss for creative Halloween ideas! If you have school lunches to pack each day, this guide will be your new best friend! We’ll share quick easy lunch ideas, organization tips, and even printable charts to help you out! Sleepovers – so much fun for the kids, but sometimes a lot of work for the parents! This illustrated recipe resource takes you through a few of our very favorite sleepover recipes – step by step! Now feeding all those kids is taken care of! I absolutely love using my slow cooker in the fall – the aroma of dinner drifts through the house all day, and feeding the family is a cinch come supper time! I have gathered up 54 pages of my favorite slow cooker recipes to share with you. Okay, maybe I went a little overboard on the Halloween Recipes – what can I say! There are so many yummy ideas! Would you like to host a simple Halloween Party but you’re just not sure where to start? We’ve got you covered! We’ll walk you through 7 easy steps – Invitations, Decorations, Music, Food, Games & Activities, Crafts & Goodie Bags. With this resource the Halloween Party Stress will be gone! Are you hosting Thanksgiving this year? If so, we’ve done the work for you! We have prepared the menu, the shopping list, and the to-do list. Take a deep breath, follow our guide and know that this year you can actually enjoy the holiday! Purchase your Special Fall Bundle now….90% off for a limited time!! Okay so I hope everyone has a fantastic week. I can’t wait to see what you’ll be eating. Thanks for sharing your plans week after week! My kids don’t like tomato chunks either. I usually omit them or mash them up so they will eat them in most recipes. I guess I shouldn’t be surprised. I’m not a big fan either. That is a great deal on resources, I’m off to check them out. I need to use my bread machine more. It’s so easy and I always forget about it. Sounds like it is always busy at your house with the kids at all different schools! Thanks for taking the time to host us every week! I can only imagine what it’s like to keep 3 children in 3 different schools and their schedules. The chicken chili sounds great! I would love to hear more ideas for sack lunches. My oldest son doesn’t eat pbj, yogurt, or applesauce. Make your own Lunchables! Crackers + cheese + meat + a fun treat! Rubbermaid makes perfect containers for these. I think they are meant for sandwiches but it is the perfect amount of room for everything. I just keep things divided by using silicone cupcake liners. They keep the crackers from getting soggy! Soup in a thermos! If you are lazy, like me, it can even come from a can! I have a thermos that can also be microwaved but I usually do the whole prep the thermos, heat the soup, put the soup in the heated thermos thing anyway to make it easier on the hubs. Thank you so much! I appreciate it! Great ideas! Thanks! Everything on your menu looks good to me today. Thanks for hosting and have a wonderful week! Potato Soup is one of our family faves, along with taco soup, and I can’t wait for it to get a bit chillier here in NC to have soups simmering all day. With me hosting Tasty Tuesday each week, I have been negligent on linking up here, but really need to get organized again with posting my weekly meal plan, so I hope to make this a priority. Thanks Jen, I’ll definitely have to check out Tasty Tuesday for some new ideas!! The bundle looks great. I am going to check it out right now. And hope paypal is an option. Thank you! Thanks for joining us Erin! I miss our bread machine. But now I have a 13 year old son who loves bread and likes to bake. He can make a pretty good loaf of Artisan bread in 5 minutes a Day nearly by himself. I could not live without my bread machine! I use it to make pizza dough, pretzel dough, all kinds of breads. I actually have not bought a loaf of bread in probably like 5-6 months. I do not use it bake the bread though only to make the dough. I prefer to use a bread pan and bake it in the oven. I actually just posted today about a simple trick to cut homemade bread…because it can get real tricky trying to slice nice uniform slices. Also, I cannot wait to read about your school paper mgt tricks. My dining room table is being taken over! Thanks! Is that picture with the crockpot and bread machine yours? If so, I have the same crockpot. Cool :). Anyway, I am with you on the large garbage can for school papers. I am actually going to write a post for how I organize our school papers- 3 tools-a garbage can and two paper trays :). I can’t wait to see yours, too! Yes that is my picture…my two favorite tools! 🙂 I actually went and bought a fancy dancy programmable crockpot one time and ended up selling it because I didn’t like it. 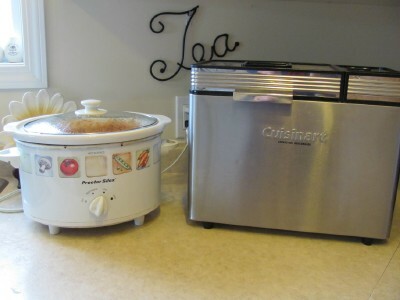 I like my simple three setting crockpot (warm, low, high) the best! That spud special soup sounds really good, and I cant wait to try it out next week. I’m like you and love my bread machine and use it to make fresh bread almost everyday. I also use it to mix up my pizza dough. I’d be lost without it. Thanks for hosting MPM Laura and have a great week! is there a way to make the link-up fields larger? trying to post the name of url is such a pain because you can’t see the whole field and something about the magic of the field it keeps trying to jump back to the beginning of the field, making it impossible to see if I have put a typo in at the end. If it’s possible to extend the length (or change the “refocus” action) I would be soo soo greatful. Hi Kendra, I will check that for next time, I’m really not sure. I did make the thumbnails bigger this time and am wondering what everyone thinks of that. There use to be 5 thumbnails across and today there are only four. What do you think? The bigger seems fine, but honestly, I didn’t even notice the difference. With the link-up exceeding 300, it might be worth it to keep it smaller, just to keep 5 per row. Hi! I just added my link (#239) but forgot to mention that this is my first time! Thanks for the inspiration! Welcome Beth, thanks for participating!! The potato soup sounds great – and I have all the ingredients withering in my fridge and garage! However, your link was for a stove top version – would you please share how you adapted it to crockpot? I simply make the soup in the afternoon when the kiddos are at school and then cook it on low in the slow cooker for a couple of hours until dinner. Works really well. Thanks for hosting. I am just getting back into meal planning and love seeing all the links! I know they say so many people have a bread maker sitting in the cupboard unused but I use mine all the time. What can be better than throwing a few things in a machine and having fresh bread a few hours later? It’s great watching them work away! I made the spud special soup last night with some homemade parmesan cream crackers (from the cooking channel). OH my, it was so delicious. I did add some precooked bacon to it when I added the milk but since my oldest isn’t crazy about bacon, the next time I make it I will crumble up bacon for a garnish. Thanks for sharing your menus. I come here everyday!! !